STAM operate, above all, in areas hit by tribal and clan conflicts and complex security environments. In this context, our activities include maximizing the possibilities of restoring the rule of law and social cohesion, developing and supporting new projects and policies with socio-economic development. STAM is active in a number of critical areas in response to disasters and in post-conflict situations, including mounting a rapid reaction capability, de-mining operations, and security sector reform. 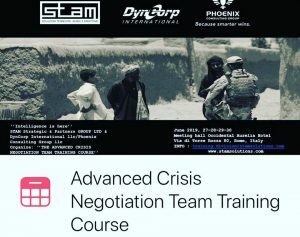 For example, in response to ethnic conflicts , civil wars , insurgent activities , terrorist attacks and natural disasters, STAM can immediately deploy tactical operations centers and security teams to secure critical sites and lines of communication, manage available resources and provide connectivity to outside support agencies within 48 hours. STAM has supported interventions in international crisis-hit areas, with stabilization and peace keeping actions. Support to re-establish the processes of governance and facilitate recovery and redevelopment in the aftermath of environmental disasters. the law and promotion of the relationship with public institutions: support in the management of conflicts among local communities and at institutional levels. usurped by terrorist , crime and narco-organization infiltration. Program support to the defense of archaeological heritage, and the formation of specialized police forces capable of preserving conservation. The Italian experience in this area is considered a leader internationally. Development program and local support, to create with liaisons , security networks with native people, through consensus actions, for business protection.